Situated on Barcelona’s Diagonal Avenue, these apartments are 150 metres from Monumental Metro Station. All the apartments at Diagonal Apartments are air-conditioned and have free Wi-Fi. The apartments are also heated and include an equipped kitchen. The building has a lift and a shared rooftop terrace with a picnic area. Within 10 minutes' walk you can find plenty of supermarkets and other shops, as well as the Glòries Shopping Centre. Note that the pictures at the top of this page are a selection of different apartments and shared areas located in the same building. Please note that late check-in after 20:00 carries the following extra charges: - From 20:00 to 00:00 € 25; - From 00:00 to 08:30 € 40. This modern, air-conditioned apartment features 3 twin bedrooms and a lounge with a sofa bed and flat-screen TV. The kitchen includes a hob, microwave and coffee maker, as well as a washing machine. The apartment also has free Wi-Fi and a private balcony. This apartment comes with 3 bedrooms and a sofa bed in the living room. There is a bathroom with a hairdryer. The kitchen is equipped with an oven and kettle. Bed linen and towels are included. The apartment also has free Wi-Fi. This apartment has one bedroom, one bathroom and a balcony. The kitchen is equipped with an oven and kettle. Bed linen and towels are included. The apartment also has free Wi-Fi. Rate: € 42.00 ... € 302.00; select dates below to get current rates. 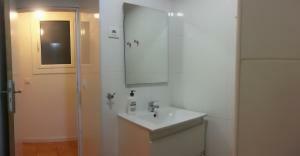 This apartment has one bedroom and one bathroom. The kitchen is equipped with an oven and kettle. Bed linen and towels are included. The apartment also has free Wi-Fi. Rate: € 48.00 ... € 274.00; select dates below to get current rates. 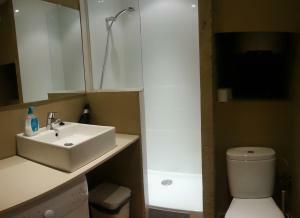 This twin room features a shared bathroom with shower and air conditioning.